ps. tomorrow I'm going away for the weekend so guess Quickly! 5 more guesses and I'll tell you. Okay, leaving in an hour so the answer was Bender Should Not Be Allowed On TV. Someone else go. Het umm...i'm gonna do one! Listen "iamfry" you can not go until DaveB has cinfirmed you're right. And your screenshot is Less Than Hero. 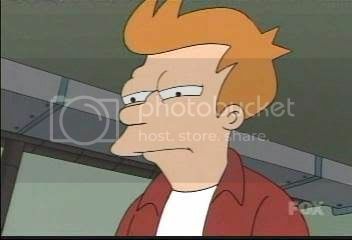 You made it easy because of the screen you chose and when you right click on the image and go to proerties, it says "Futurama-S05E06-LessThanHero1.jpg". The Lesser of Two evils ? Also iamfry, try not to double, triple, quadruple or quintuple post. Use the button instead if you left something out of your post. A Head in the Polls. Well since I guessed you other framegrab I think it should be my turn. Someone else can take my go. 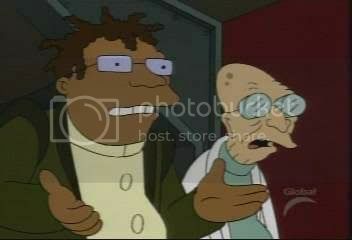 Bender should not be allowed on TV ? Clearly its: The Sting. Someone else take my go. Nope! lol don't just assume your right when you're not... as remember guys on that part of the Sting Hermes is on the right and Prof is on the left remember.......? I doubt this is right but XMas Story? Damn. That's my bad. It's just once I knew for sure I was right and I was, and i thought I was right again but clearly not. So I'll guess Obsuletly Fabulous.